During a successful event launching the grand opening of the Vermeer Applied Technology Hub, leaders of Vermeer Corporation and Iowa State University expressed optimism about what the future holds for their evolving relationship and gratitude for the mutually beneficial opportunities that are presented when a global leader like Vermeer comes together with world-class students at Iowa State. Vermeer Chair of the Board Mary Andringa gave the example of the Vermeer International Leadership Program to demonstrate the partners’ shared commitment to advance the educational instruction of students using real-life Vermeer opportunities. In its second year, the Vermeer International Leadership Program is a 12-month long, immersive leadership experience where Iowa State students – Vermeer Leaders – are given a unique opportunity to learn first-hand how companies like Vermeer operate on an international scale. Participants take coursework in leadership focused on both domestic and global impact, and receive mentorship through interactions with Iowa State faculty and Vermeer employees. 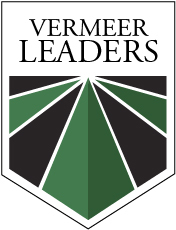 In addition, the program offers a $2000 scholarship and funded support for a week-long trip abroad to one of the Vermeer international facilities. Eighteen students completed the program last year and 20 are in the cohort this year. Tara Edberg, Lecturer in Leadership Studies, oversees the program. She said the program’s impact has been very positive and provides students a unique experience. Students gain self-knowledge, learn to address global challenges, increase their cultural competence, and develop their own leadership potential. 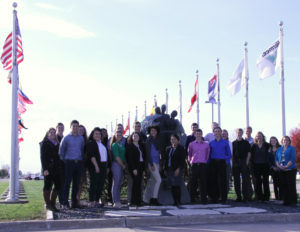 According to Edberg, the program has allowed students to gain valuable leadership and interactive opportunities that they would not otherwise had. This year’s week-long international trip will be over winter break and to the Netherlands, where the cohort will meet with the Vermeer team in their Goes EMEA office. The cohort is also scheduled for additional learning opportunities. Vermeer President and CEO Jason Andringa agrees the Vermeer Leaders will make and leave a lasting impression on society. The program is accepting applications through February 1, 2017 for the third cohort, which will be selected in March.